Well, we’re back. What a fantastic trip! It was so nice to spend some time with just the two of us. Relaxing and enjoying each other’s company. In the fast world that we live in, we don’t have much time to do that. Between church, work, kids, friends and general commitments like keeping up the house, it becomes easy to neglect spending quality time together. So, a rundown of the trip! 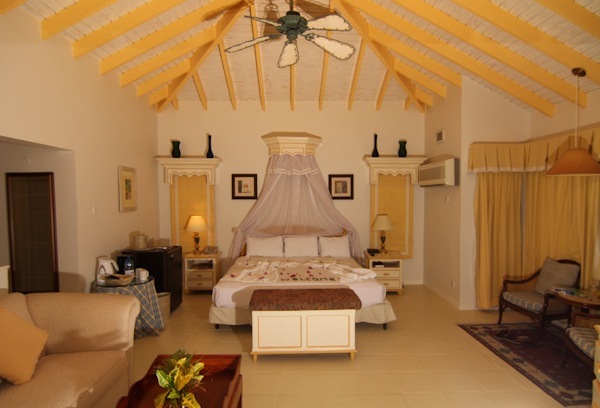 We stayed at Jalousie Plantation. 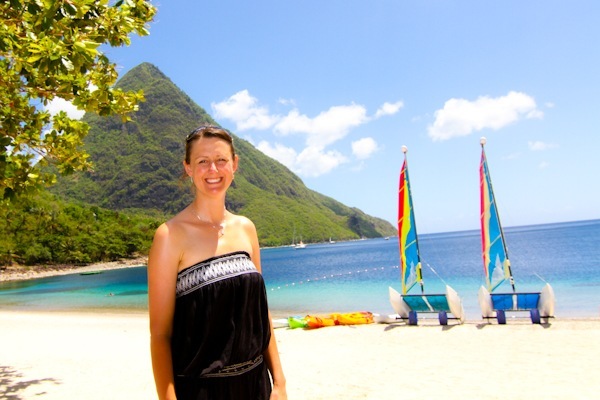 Jalousie is a resort that is situated in a bay right between the Pitons in St. Lucia. 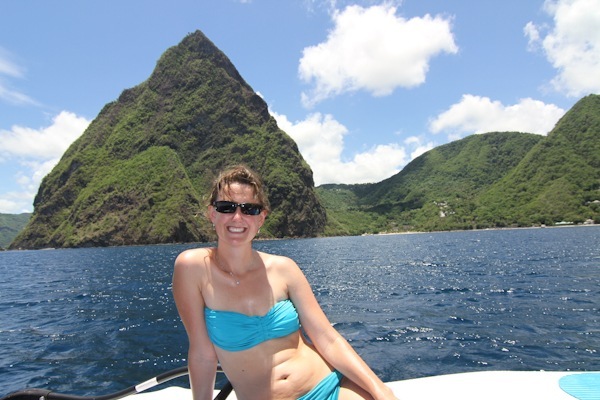 The pitons are basically mountains. 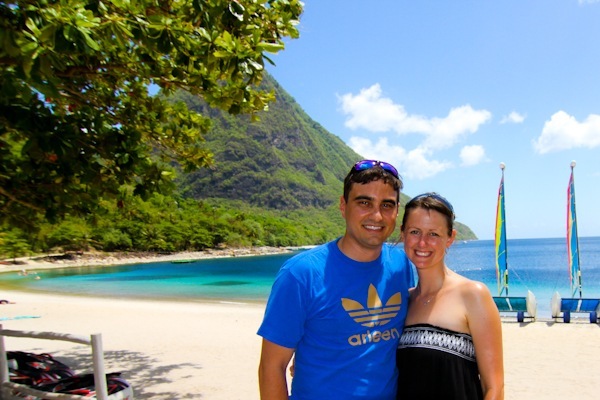 St. Lucia is known for the Pitons so we opted to stay somewhere that would be memorable. There was a fair amount of remodeling that went on while we were there, which really worked out to our favor. The first room we had was about mid-way up the resort. 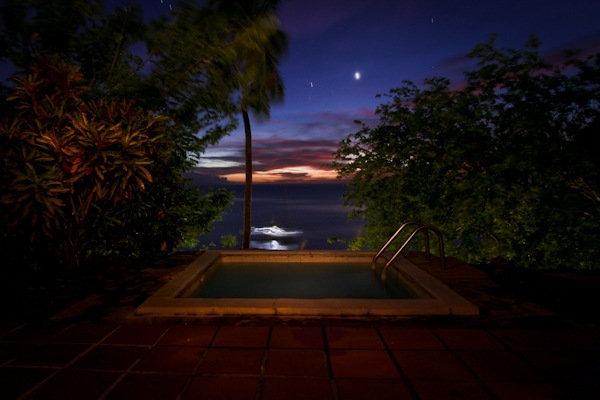 It was one of those “garden view” rooms, but we did have a small view of the ocean. All of the “rooms” are little cottages. They have vegetation surrounding them and are spread out so you feel like you are in a house in the middle of no where. Here’s a shot of the inside of our room. We asked about upgrading to a full ocean view when we arrived, but the didn’t have any rooms available. We were able to switch rooms after a few days though. We almost didn’t switch because we didn’t want to re-pack. But we did…and it was worth it. Our second room had an AWESOME view of the ocean. It had a dip pool out back (the first one did as well). 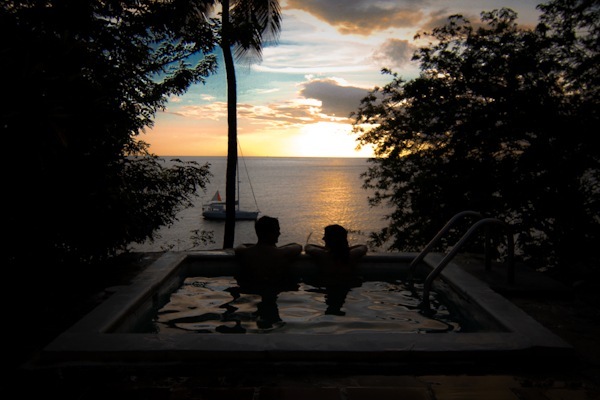 We spent a lot of time in the dip pool just watching the ocean and watching the sun set over Petit Piton. Here’s a view from our pool. We spent most of the day down at the beach. The beach was a little rocky, but there were really cute huts to protect from the blazing sun. 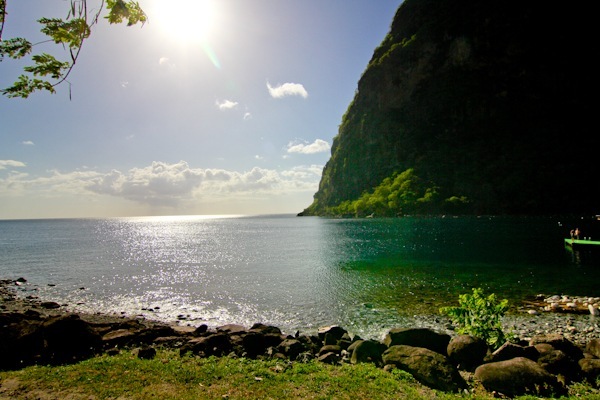 St. Lucia is close to the equator so the sun is intense. There were little flags you could put up when you were hungry or thirsty. When your flag went up, staff ran over to assist. Really, what more could you ask for? We could hardly believe that this was the site we’d see every day for the next 5 days. Here are some shots from the beach. The first one is a rainbow we saw one morning while having breakfast in the Bayside restaurant. There were some pretty neat activities at the resort. Snorkeling was fantastic. 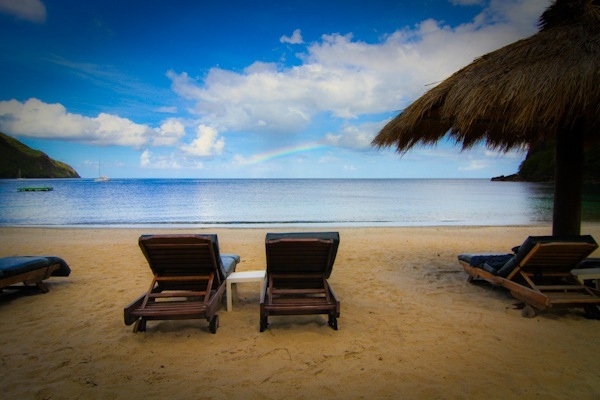 In fact, many of the other resorts and cruise ships used the snorkeling area at our resort. 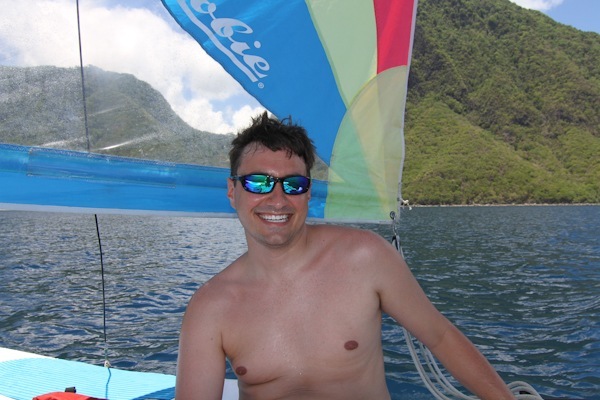 One of the other fun activities was sailing a Hobie Cat. Laura and I had never done it so we got a quick 30 minute lesson one morning. 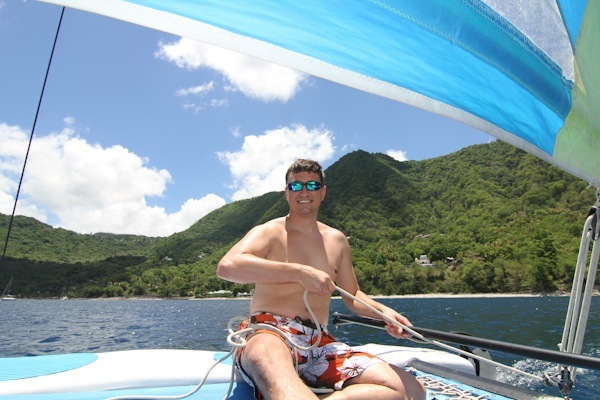 We took the Hobie cat out twice after our lesson. It was a lot of fun and made me want to get one! 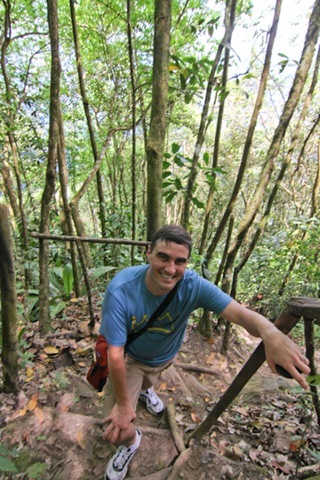 Probably our most surprising part of the trip was a hike up Gros Piton. Gros Piton is the taller Piton that it situated to the Southern side of the resort. 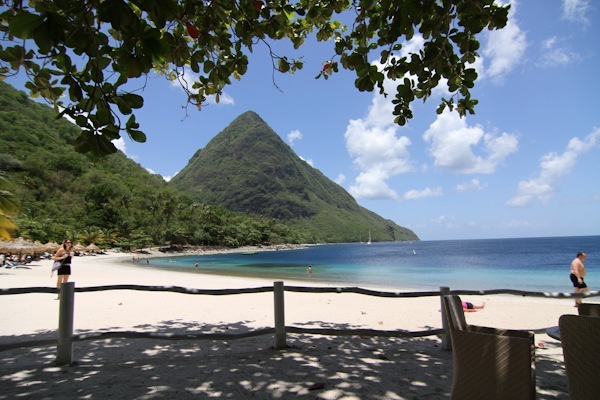 It is taller than the Petit Piton, but is much easier to hike. 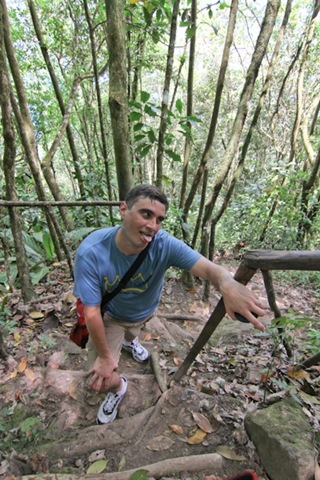 I say it is easier to hike, but don’t think it was easy. Quite the contrary. It may have been one of the more difficult things I’ve ever done. 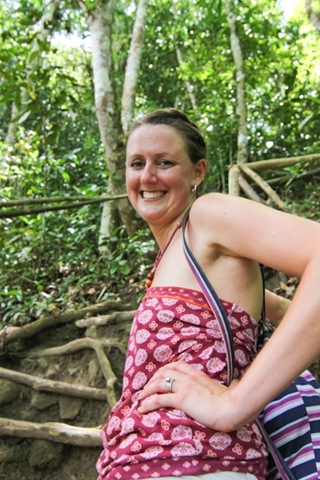 I didn’t get much sleep the night before and Laura felt queasy at breakfast so she didn’t eat much. Both of those things were stacked against us. The hike was a little disappointing. Possibly because we have such a phenomenal view of the Pitons from the resort, the hike up just didn’t provide much more. The hike was only about 2 miles, but it took us a full two hours to make the climb. We were literally climbing up boulders on the side of the mountain. Coming down was a little faster, but not by much. Our tour guide up the Piton was Luciano. 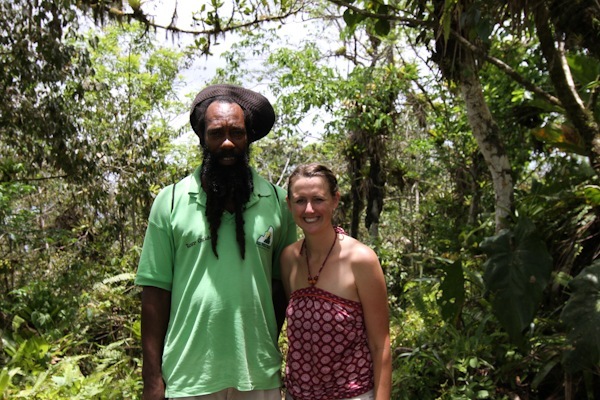 He was a Rasta Man. He spent a good bit of time telling us about life. He asked us what spirit we had in us. We told him we had the Holy Spirit. He said he had the spirit of nature. Very interesting dude. He LOVED to talk. Here are some photos from the hike. The day after the hike, we were in a little pain. Nothing major, just some sore muscles. We decided we should get a massage together. It was my first time to ever get a massage. I thought it was going to be awkward, but it wasn’t. I’ll probably get another one before I die. Doubt I’ll get another next week. 🙂 The location of the massage was awesome, though. They even had mirrors at 45 degree angles on the ground so that when you were face down, you could see the ocean. Nice touch. 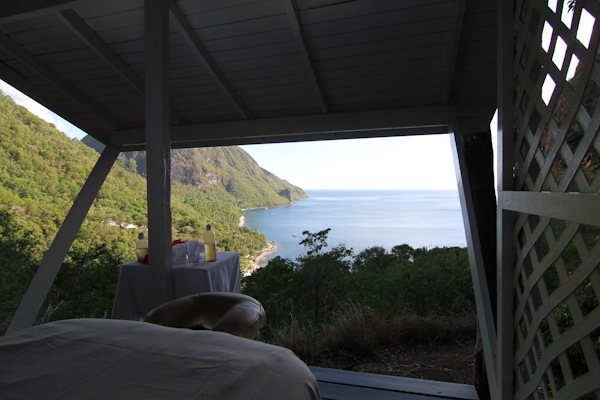 Here’s a picture from where we got our massages. All in all, our trip was a blast. Probably the worst part of the whole thing was that we didn’t discover the best dessert on the island until the next to last night there. (it was a soufflé) But we were able to knock back three of them before we left. The food was great. The weather was great. The company was great. We knew the kids were in good hands with my parents towards the beginning of the vacation and Laura’s towards the end. And now…back to reality. We’re definitely coming back refreshed.